John Broomfield was born in Hampshire, England in 1822, son of Anthony and Mary Broomfield. He married Hannah, daughter of John Humphrey and Sarah, née Morris, at St Andrews Church of England in Sydney in 1855. 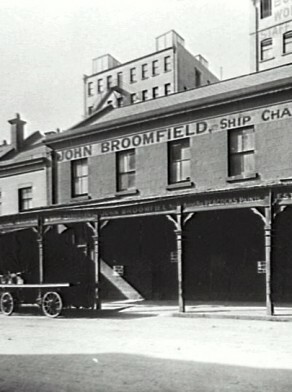 John Broomfield died at his Balmain residence on 22 August 1903, aged 82, leaving a family of 10. Hannah Broomfield died in 1914. The family is buried at St Jude’s Church of England, Randwick. John Broomfield went to sea at an early age and gained his master’s certificate in 1845. He sailed the China run before arriving in Sydney in 1847 and trying the Turon River goldfields. He went back to sea, visiting South America and California and returning to Sydney in 1849. With Reginald Whittaker, he established Broomfield and Whittaker, later Broomfield and Co, merchants and ship chandlers of Albion Wharf in Sussex Street. He was a Master Mariner who became a member and later vice-president of the Marine Board. He was also a director of Mort’s Dock and Engineering Company, the Fresh Food and Ice Company (also a founder), the Mercantile Mutual Insurance Company and the NSW Creamery Company. In February 1872, Captain Broomfield bought Glentworth House in Darling Street Balmain. He engaged Balmain architect Edward Harman Buchanan to extend the house and add an upper storey. The house comprised substantial accommodation, spacious grounds and a lovely garden. Broomfield was an award-winning horticulturalist. He was known for presenting prize blooms from his hot-house to ladies on the nearby Balmain ferry. His family remained in Glentworth House until 1913 when his wife sold it to the merchant George Morgan. It was demolished in the 1970s. In 1882, Broomfield also bought up land and cottages in nearby Datchett Street Balmain. Captain Broomfield was Alderman for Denison Ward for the Sydney City Council from 1 December 1863 to 30 November 1865. As an active member of the Balmain community and a JP, he served as the Alderman of Balmain Council from 1874 to 1875.